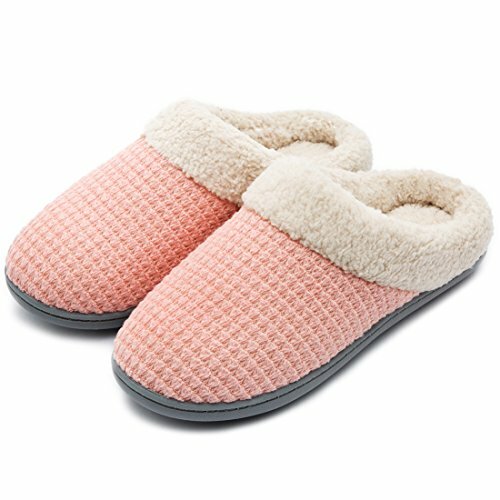 Women's Comfort Coral Fleece Memory Foam Slippers Plush Lining Slip-on Clog House Shoes for Indoor & Outdoor Use (Small / 5-6 B(M) US, Pink Knit) | What Should I Say? ULTRAIDEAS Cable Knit Plush Slippers - An Intimate Gift for Our Feet! When I was just a kid, I always enjoy the time lying on the legs of my mother as she get back after work. However, she kept suffering from the tire of feet after a day's hard work. As I fell asleep, I dreamed that I put on a pair of slippers with comfy for her and she smiles. That is the most beautiful dream I have ever had. Get these Cable Knit Plush Slippers for you and your loved ones and show our feet a nest to relax. Why Choose Our Cable Knit Plush Slippers?
? The design of breathable cable knit upper makes it a perfect choice for all seasons.
? The edge of the slippers is seam crafted, not easy to crack, solid and reliable.
? Machine or hand washable, easy to care, ultra soothing comfort.
? 100% no risk money-back guarantee. *We appreciate the input on our slippers. Treat our feet and grab a pair today! - RISK FREE - Click ¡Add to Cart' above to get yours now! BREATHABLE TEXTURED UPPER: Constructed with spun yarn line, these chic small pieces will let you free from sweat moisture. COZY & SOFT SHORT PLUSH LINING: Sliding into these slip-on slippers, you will be addicted to the cozy and skin-friendly plush lining with barefoot or feet with socks. MULTI-LAYERED & HIGH-DENSITY CUSHIONING: The cushioned memory foam really molds to your feet's unique shape for a custom fit and will retain their shape. DURABLE & SLIP-RESISTANT RUBBER SOLES: With anti-skid texture on the rubber sole bottom, these stylish slippers are suitable for both indoor and outdoor. IDEAS TANKEN TO ULTRA HIGH STANDARDS: Be sticking with high standards, our ULTRAIDEAS strives to offer each customer a better service and product from beginning to end.